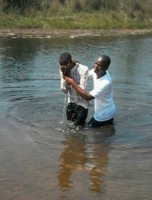 In his recent report, one of HeartCry's newest missionary pastors in Zambia, Joshua Lungu, shared the encouraging news of two more baptisms. He also explains how one of Kabwata Baptist Church's pastoral interns is helping him in evangelism efforts. The coming of Ntungamili, a Kabwata Baptist Church pastoral intern from Botswana, has brought a lot of encouragement, especially with evangelism. It is always encouraging to do outreach with someone else, learning from our Lord Jesus Christ, who sent them in twos. We hope to focus on reaching out to the people in the area where the church plot is located and in the teachers’ compound of Kasama Boys Secondary. Evangelising in the area where we are currently meeting for worship has also continued. Reaching out to the families in our area with the gospel, I thank God that I am learning a lot about these families and this in turn presents a good platform for speaking the gospel to them. Aunt Doriana has also continued diligently with the ministry of reaching out to the children through Bible club. By and large, the mammoth task of explaining the gospel continues and, thank God, it is bearing fruit, as you will notice under the next heading. We are grateful to God that, after having spent a wonderful time of explaining the gospel to Titus and Rogers, it pleased the Lord to have them baptised on the 3rd of September 2017. It was so very good to see these two young men declaring publicly that they are followers of King Jesus Christ. We are indeed forever grateful to God, who is at work adding to his church. The young men are now eager to serve and be part of God’s family. We now trust the Almighty God to use them, keep them.